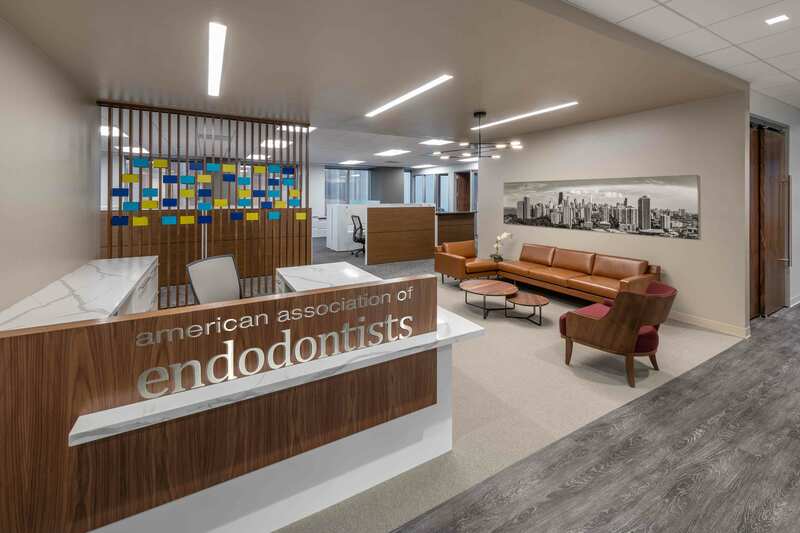 The American Association of Endodontists wanted to inspire and energize employees and members through a welcoming environment that effectively supports the innovative and collaborative work of AAE. 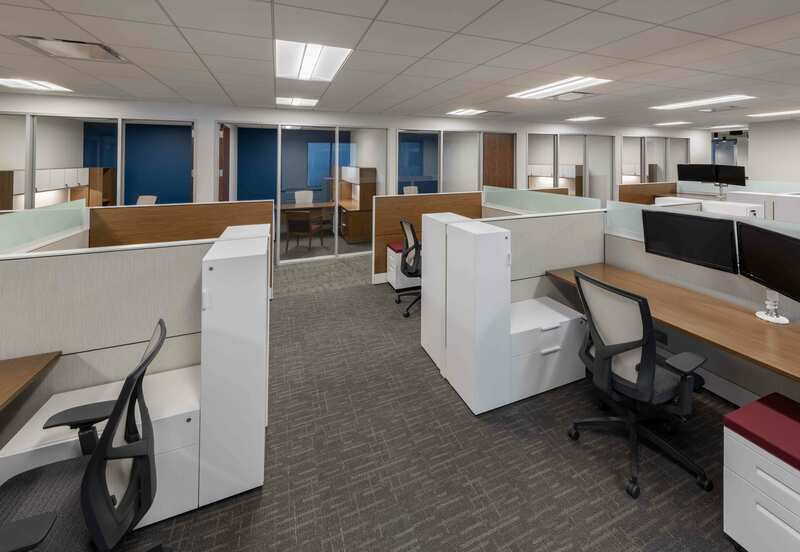 The 8,000 SF relocation from the American Dental Association building to nearby 2 Prudential Plaza created open and connected work spaces supporting effective employee engagement and interaction. To support new and legacy staff, we provided an adaptive and open plan conducive for both individual and group work. These functional areas are supported through color and material palettes that bring warmth, while accents of color contribute to the energy of the space. Soft lines and curved silhouettes in furniture selections support elements of warmth and provide a welcoming and comfortable space. The welcoming experience starts as at the entry to the AAE suite. The reception area is branded with colors and signage that references the brand logo and greets any employee or guest immediately as they walk through the doors. The feature wall behind the receptionist includes photos and personalized information about each team member on the workspace side so that every team member sees themselves and each other in the workspace upon arrival and exit. Focus rooms and offices were added against the core and off the glass to provide a private area for employees to conduct meetings and allow ample light to fill the work areas. 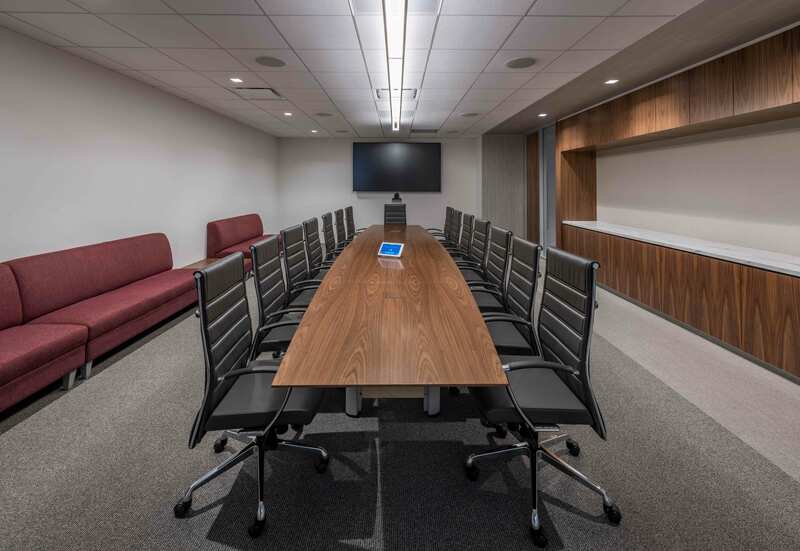 A large conference room with both chairs and lounge seating allows for more than enough space to bring clients and employees together. To set the stage for a contemporary yet comfortable place for staff to collaborate and socialize, the café space has warm hues, comfortable and varied seating options, and an exposed concrete ceiling with a custom light fixture. Simple down lights and plenty of natural light pool into the break room making the space feel larger and more inviting. Technology is incorporated in this space through a large flat screen television with ceiling speaker installations to facilitate regular all-staff meetings to keep employees informed of their mission and progress. 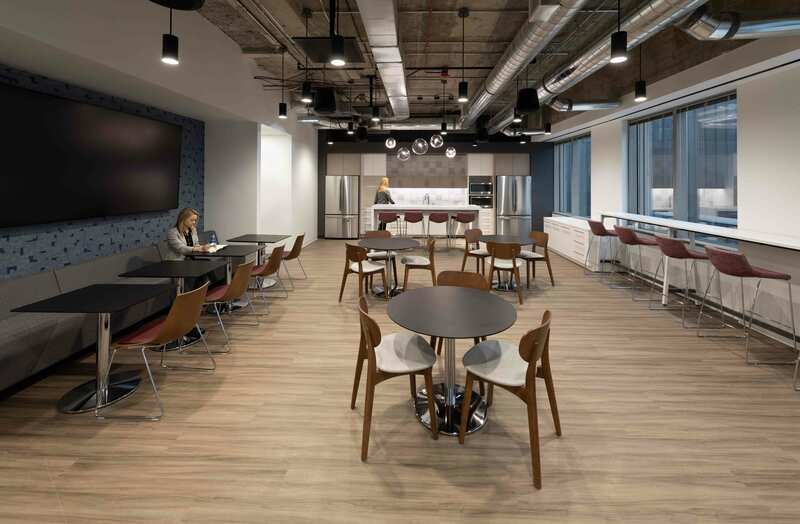 Tech and power-enabled table and counter top seating arrangements are designed to support work, employee socialization, and impromptu communication.